Content is king in the digital world, but continuously creating original content takes a lot of time, effort, and copywriting resources that most companies do not possess. As a result, these companies must curate content from outside sources to add to their article arsenal of original blog writings and media coverage. Such content curation involves searching, selecting, and supplementing outside content and then sharing it on the social Web. Since all content is not created equal, it’s essential to choose high-quality content to maximize reader interest, brand awareness, and company credibility. To help companies carry out their content curation goals, TopRankBlog.com offered the following best practices for better content. 1. Seek Smart Sources of Content to Curate – Top sources of content are industry newsletters, shared links to content and media on social sharing websites, content curation tools like Scoop It and Flipboard, and search engines. Other strong streams include Google Alerts and Google News, similar niche topic blogs, news aggregators, and press release distribution services. 2. Choose Key Categories of Content to Curate – Seek out informative resources that are relevant to the target audience such as blogs, news, industry events, and training tools. Other top types include content from industry leaders, provocative related news, authoritative research and reports, online videos, white papers, and data visualization resources. Finally, knowledgeable comments from blog posts and industry surveys can also provide interesting content. 3. Pick Prime Places to Publish Curated Content – Once the content has been properly curated, make sure it’s published it in the right places. These include company blogs, email newsletters, social media channels, eBooks, industry websites, and specific news microsites. Let these best practices be your guide for content creation, curation, and distribution that reaches and resonates with the target audience. These should provide an ideal mix of original, curated, and repurposed content to give a company a steady stream of interesting and useful information for their search and social media sharing efforts. 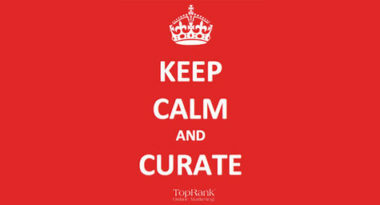 To learn more about incorporating content curation into your digital marketing strategy, contact MDG Advertising. MDG Advertising, a full-service advertising agency with offices in Boca Raton and New York City, is one of Florida’s top integrated marketing agencies. Our 360° integrated marketing strategies use just the right mix of traditional and digital advertising to reach your goals. Our core capabilities include branding, logo design, creative, online marketing, print advertising, media planning and buying, TV and radio, Web design and development, email marketing, mobile marketing, content curation, blog writing, social media marketing and SEO. While some industries may fare better in print and others online, we strive to create a balanced approach, where traditional, social media, and digital marketing efforts support each other and your message is tailored to the medium. To stay on top of the latest content curation trends that will make an impact for your business, contact MDG Advertising. Read more at TopRankBlog.com.